Your order #12345678 has been received and is currently processing. 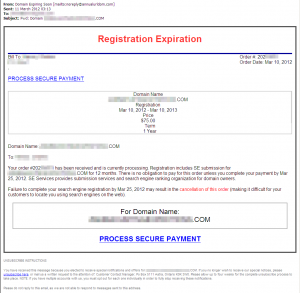 Registration includes SE submission for EXAMPLE.COM for 12 months. 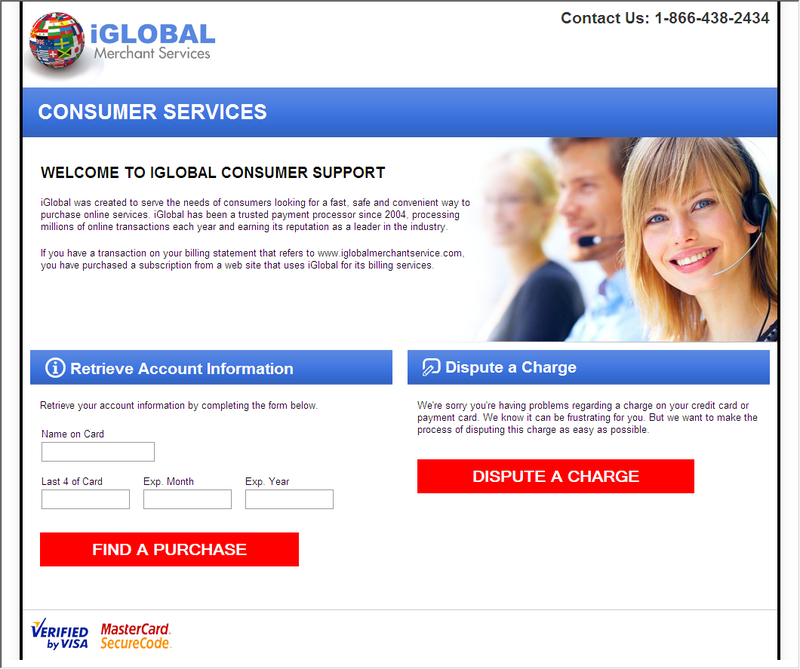 There is no obligation to pay for this order unless you complete your payment by Mar 25, 2012. SE Services provides submission services and search engine ranking organization for domain owners. Failure to complete your search engine registration by Mar 25, 2012 may result in the cancellation of this order (making it difficult for your customers to locate you using search engines on the web). 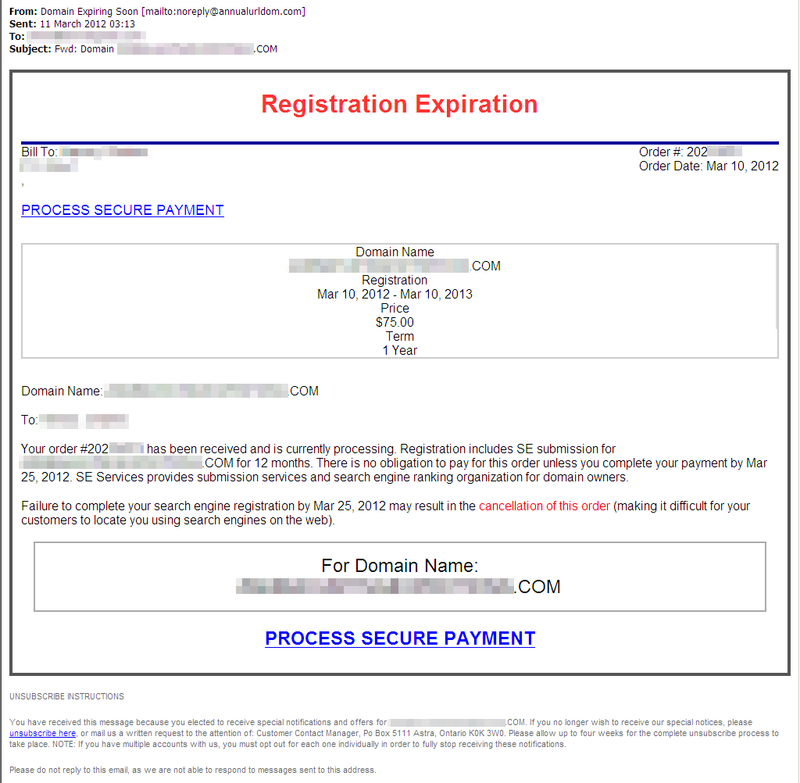 While this email carefully avoids any mention of the expiry or renewal of your domain registration, the intent is clearly to fool and scare the recipient into thinking that their domain registration is about to expire so that they click one of the prominent “PROCESS SECURE PAYMENT” links and complete the payment process. If you do this, your domain will not be renewed, and you’ll be out $75 (in this case) for services of dubious value that you may or may not actually receive. Additionally, you might be opening yourself up to identity theft and/or the abuse of your credit card information. In fact, if you have already fallen victim to this scam, we suggest that you contact your credit card company immediately, and check to ensure that your domain is “locked” and still registered to you and under your control. NinerNet attempts to protect our clients from these kinds of domain-related scams by having a policy of “locking” (as mentioned above) all domains under our management that can be locked. However, you should still be cautious before acting on any emails not from NinerNet (or your actual domain registrar if it’s not NinerNet) regarding any domains you have registered, especially if they attempt to scare you into taking action. Please contact NinerNet support if you have any questions about emails regarding your domains, and we will help you.